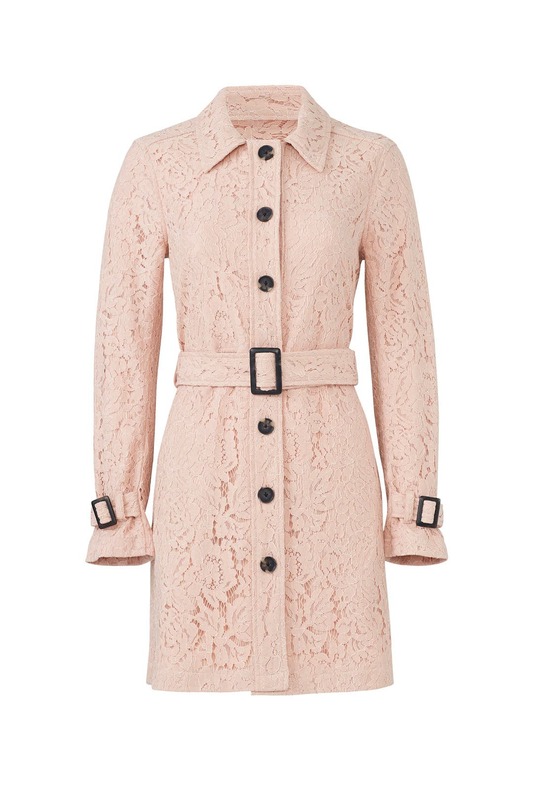 Floral lace puts a decidedly feminine spin on the classic trench coat. This pretty-in-pink silhouette by cupcakes and cashmere is an easy way to add polish to any look. This coat runs true to size. We recommend going one size up for backup (see following fit notes for exceptions). Pink lace (80% Nylon, 20% Rayon). Coat. Long sleeves. Exposed front button down closure. Separate belt. Attached cuffs. Fully lined. 34" from shoulder to hemline. Imported. The medium was the right choice. Wore it all day, buttoned up. Perfect for a cool spring day. PS the belt was packaged in its own bag (like how the sunglasses come wrapped), so make sure you check the whole garment bag if you think the belt is lost! I loved this rental. I own many items from this brand and wouldn't normally order from RTR since it's not a high-end price point that I don't always have access to. Being lace it's not as practical to own so it ended up being a great rental piece. I wore it as an open duster jacket over jeans and without the belt. I can also see wearing it belted this Spring over a dress. Lovely color, flattering design, perfect for transitional spring weather. It looks equally nice buttoned for a different look. 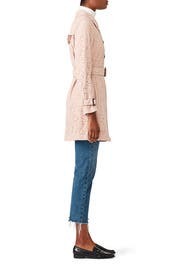 It fits true to size for this brand--I'm normally a 6/8 in dresses but take a L in Cupcakes and Cashmere jackets as they're cut smaller in the chest. 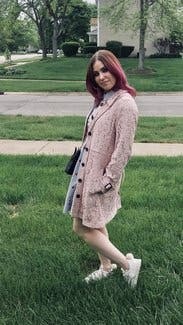 Rented this for a trip to Paris and this jacket was perfect for spring weather. Rented this to wear for spring in Chicago. I really enjoyed it. 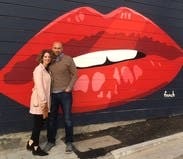 One coat check attendant remarked "thank U for some color in a sea of black and gray"! It's slightly small in the shoulders. But other than that a pretty true medium and I am a six-eight. It's light weight which was perfect for layers and I'm warm natured. Didn't get to test it in the rain-happily- but I don't think it would perform well. The fit on this coat was great. It is comfortable against the skin and can be worn with a simple pair of jeans or over a dress to make it a bit fancier. What a beautiful jacket!! 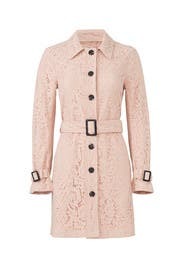 The quality was superb, materials were soft and the lace on the coat was excellent quality. 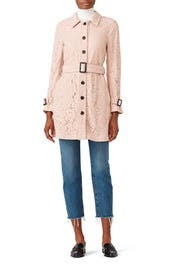 Just FYI, it's a very lightweight jacket, but that makes it the perfect trench for spring! I wore this everyday and not once did the lace pull or wear out. I love the beautiful blush color too- it goes with everything! I needed to own this- so I bought it!! I highly recommend! It is so beautiful! Very nice lightweight jacket. I loved it considering buying. I gave four stars because the buckles on it feel really cheap. I rented this for my trip to San Francisco but never got to wear it because the weather was surprisingly warmer than usual. I did try it on and it seemed to fit. I will probably rent again when the weather turns cooler in the fall. Unique overcoat, perfect for California fall/winter. Well structured and beautiful color. How unfortunate this was delivered without the belt - look is too bulky without the belt, so I have been wearing this spring coat open. Would have been very tempted to buy it if it had come with the belt. Would suggest RTR post pictures WITHOUT the belt/ warn you this particular item was missing the belt. 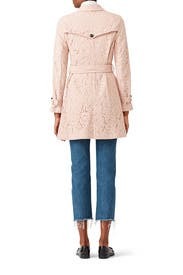 Fun spring coat. Dusty rose color very versatile. 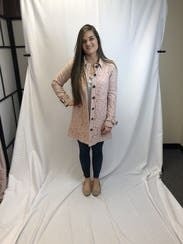 Cute spring or fall coat to add a little color to the coat closet. great coat, form fitting, nicely lined inside. I love this coat! The color is so pretty and it feels like such good quality. The length is perfect even though it's a bit longer on me than on the model. I chose to wear it without the belt because I liked the way it looked without the buckle in front. I wore the Medium and it was perfect, so I'd recommend ordering your typical size. Beautiful Jacket. It's missing the belt. It's perfect to wear on top of sweater without looking bulky at all. Great fit. Fit perfectly and looked very classy! Not very heavy so definitely more of a spring coat. 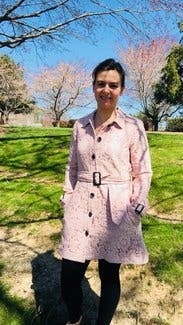 This lightweight, pretty spring-hued coat was a pleasure to wear. 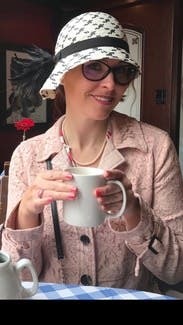 I wore it with dresses and with jeans and really felt special in in.